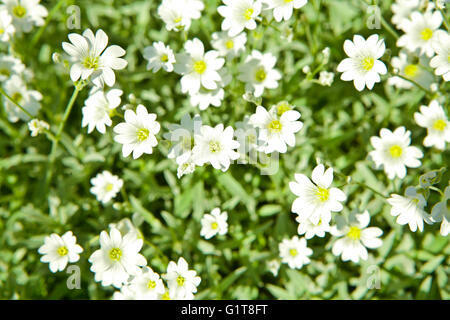 Cerastium arvense is a species of flowering plant in the pink family known by the common names field mouse-ear and field chickweed Cerastium arvense is a perennial herb growing up to 30 to 45centimeters tall. It takes the form of a mat, clump, creeper, or upright flower, and may grow from a taproot or tangled system of rhizomes. It is usually somewhat hairy in texture, often with glandular hairs. The leaves are linear, lance-shaped, or oblong, and a few centimeters in length. The inflorescence may consist of a single flower to a dense cluster of many. The flower has five white petals, each with two lobes, and five hairy green sepals at the base. The fruit is a capsule up to 1.5 centimeters long with ten tiny teeth at the tip. It contains several brown seeds.